The Advantages of Creep Feeding Calves | All Around Fence Co. Inc.
Cow calf producers often creep feed their calves. 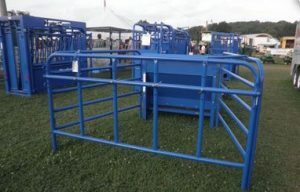 Utilizing creep feeders– something All Around Fence sells— allows calves to access their creep feed full of nutrients while keeping older cows away. Why creep feed? The common management practice maximizes the calf’s growth at a rate closer to its genetic potential. In other words, it gives them a boost. Sure, milk and pasture grazing help grow calves, but they get extra nutrients through creep feed. It’s estimated that a creep-fed calf will gain an extra 100 pounds over a typical summer, compared to one who is not creep-fed. If not 100 pounds, then expect at least 30 to 60 pounds. In most markets, the weight gain is well worth the creep feed cost. When considering to creep feed or not, there are some questions a farmer needs to think about… How are current calf prices; will added calf weight mean more money in the long run? How costly is feed? Is there forage availability and is it of good quality? Are there enough workers to make this practice work well on the farm? How long does the owner plan to keep the calf or calves? How long would calves be creep fed? Certain farms may see creep feeding as the smart thing to do, while others may not see it as economically viable. Oftentimes, the decision comes down to what it always comes down to in business: money. That said, creep feeding calves is typically done to get calves used to feedlot rations. While calves prefer milk first and foremost, since it is a vital supplier of nutrients when they’re nursing, keep in mind that creep and forage are also important parts of their diets. In general, creep feeding needs to be provided for at least the last two months before weaning. Creep feeders– available from All Around Fence– should be placed in an area frequented by the cow herd. Typically, a feeder is put near watering areas. To attract calves, a farmer might provide salt and mineral offerings nearby, too. Check out All Around Fence’s various farm products, including creep feeders, here. Call 1-800-349-0331 for more information.